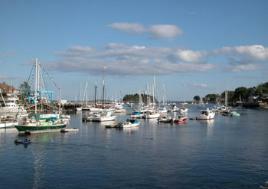 bob in the bay and schooners dominate the harbor. filmed in this story book town. slopes gradually down to meet the lapping water on their private rocky beach. Anne’s lace and golden rod. anyone wishing to escape the rat race, the High Tide Inn fits the bill. through the dining area, which adds to the homey atmosphere. warm night and watch for shooting stars. easily enticed in to ordering a lobster. each year. More than any other fishing port in the world. 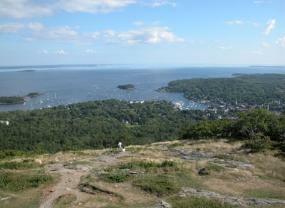 Lastly, you can’t go to Camden without having a picnic lunch on Mount Battie. islands with a lunch from the Camden Deli on Main Street. show. It makes for a perfect ending to an idyllic place. About the author: Susan Fogwell is a flight attendant for a major international airline. growing up, she spent her summers on Lake Cobbosseecontee in Winthrop, Maine.